Whether it is for your State Police, County deputies, City Swat Team, Correctional Officers or the U.S.Secret Service, we have your BDU's. 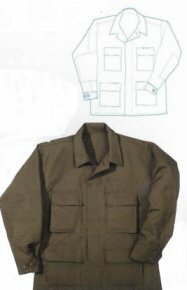 Battlefield dress jacket, 65/35 ripstop, khaki or black, meet MIL specs, button down flaps, available in all NATO sizes and Short, Medium and Long length. 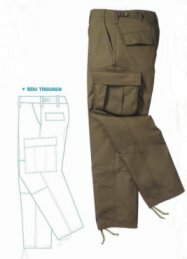 Battlefield dress pants, 65/35 ripstop, khaki or black, meet MIL specs, button down flaps,adjustable waist tabs available in all NATO sizes and Short, Medium and Long length.